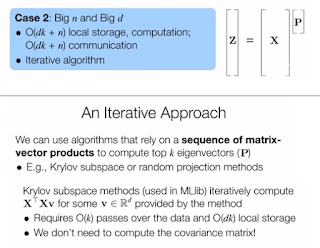 Курс Scalable Machine Learning. Hadoop, Apache Spark, Python, ML -- вот это всё. Продолжаю конспектировать пройденный курс. Неделя 5, продолжение. В прошлый раз начали разбирать теорию PCA. Далее: пятая неделя, лекции, алгоритмы вычисления PCA в распределенной среде, бигдата. WEEK 5: Principal Component Analysis and Neuroimaging. 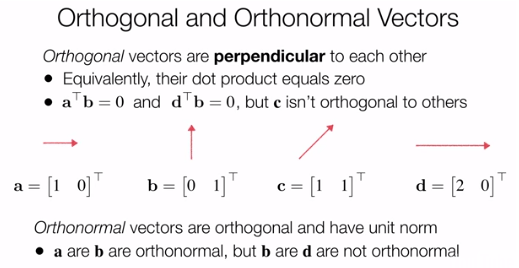 is that their dot product always equals 0.
a vector whose Euclidean norm equals one. of d is greater than one. the interpretation of PCA as an iterative algorithm. become the i-th feature in our new representation. and thus, these k directions are orthonormal. Так как же нам найти Принципиальные Компоненты и получить редуцированный датасет? centered. 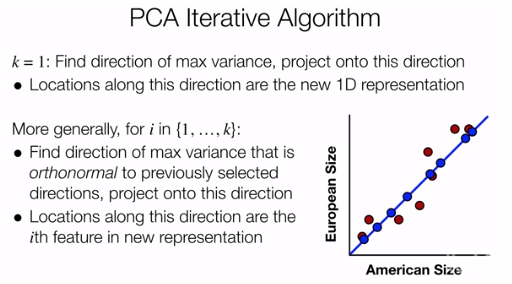 And so the first step in PCA involves centering our data. by d matrix which we'll call x.
matrix, or the scatter matrix. matrix without dividing by n.
as discussed in the previous segment. to compute the PCA scores. Как посчитать PCA на практике, с учетом того, что количество фич невелико (small d). … we must center our data. And to do this, we must compute the mean of each feature. 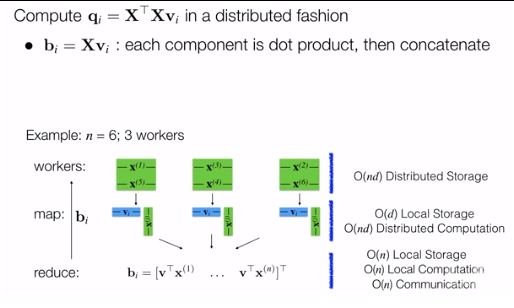 There are d features, and thus d feature means. i-th component is the mean of the i-th feature. 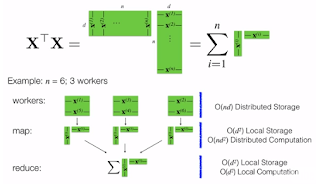 by simply dividing by the number of data points, n.
simply involves subtracting m from each original data point. 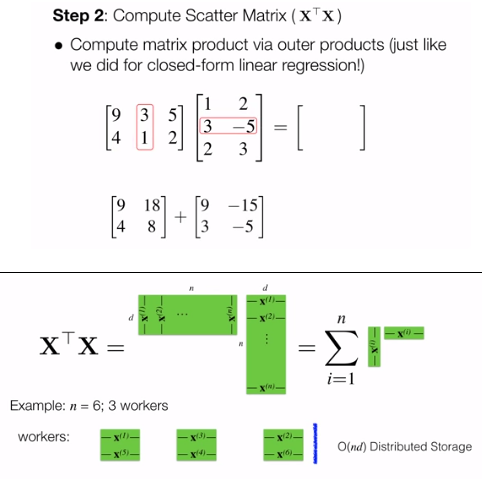 … we next need to compute the scatter matrix. fashion by using outer products. Матрица ковариантности = X transpose * X, а это это сумма произведений строк датасета. Очень легко ложится на модель распределенных вычислений. only a single row of x, or a single data point. in a data parallel fashion. 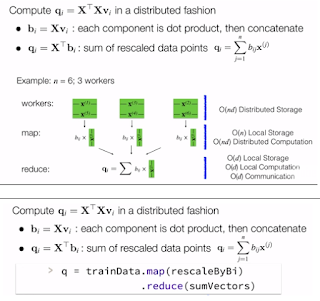 as a simple MapReduce operation. and compute its outer product with itself. all of these outer products. both of which are feasible since we're assuming that d is small. 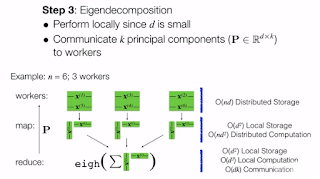 we need to perform its eigendecomposition. are the top k eigenvectors of a scatter matrix. 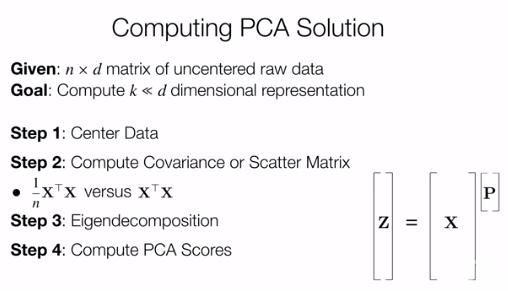 We represent these principal components by the d by k matrix P.
we have access to the top k eigenvectors on the driver. which is the communication bottleneck in this algorithm. generally requires cubic time and quadratic space. 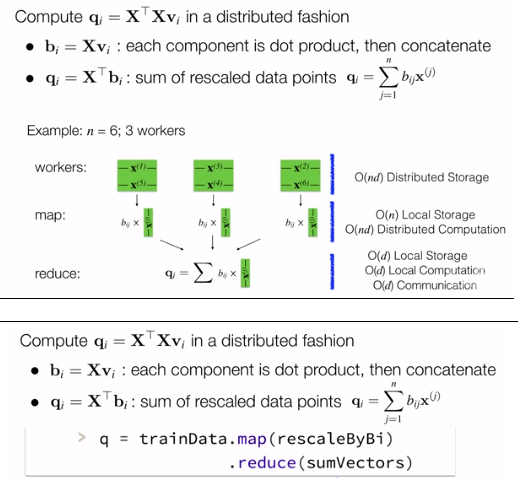 we can reduce this time complexity to O of d squared k.
and can be performed via a simple map operation. Простой алгоритм, но можно упереться в количество фич, превышающее возможности Spark кластера. Не беда, есть способ проделать PCA в Big N and Big D setting. Ключевая идея заключается в хитром, итеративном способе вычисления ейгенвекторов. we can only afford storage, computation, and communication that are linear in N & D.
So we can't locally store or operate on the scatter matrix. Instead, we'll introduce an iterative approach. to compute the top K eigenvectors of the scatter matrix. Krylov subspace and random projection based methods. 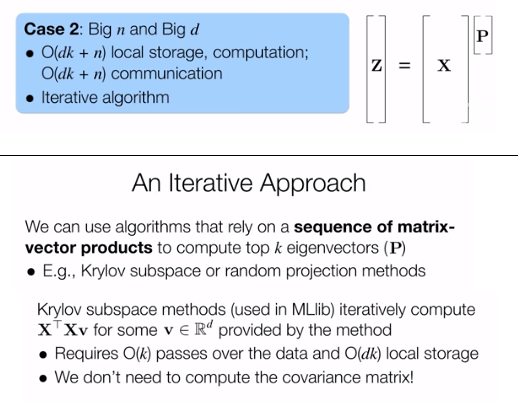 And Spark's MLlib in particular relies on Krylov subspace methods. or passes over the data, and O of DK local storage. communicating the D dimensional vector, vi, to all workers. as the D dimensional vector qi. which are the top K eigenvectors of the scatter matrix. i here to denote the iteration number. to the workers in step one changes on each iteration. of both X and X transpose. we're able to work to achieve our desired goal. equal to x times vi. and step two by only storing X in a data parallel fashion. dot product between a row of X and the vector vi. and vi, and then concatenate the results to obtain bi. the dot product of each data point and the vector vi. distributed computation to compute the dot products. Next, in the reduce step, we can simply concatenate the results. in order to compute the overall result, qi, in the next step. So we're going to need to communicate bi to each worker. requires linear time, space, and communication in terms of n.
then collect the results, which creates a list. And finally, we convert this list into a NumPy array. Now let's consider the second step of this two step process. In this step, our goal is to compute the product of X transpose and bi. as the sum of rescaled data points. which gives us a new d dimensional vector. 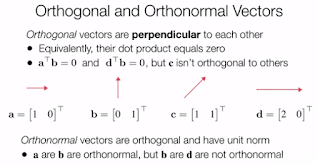 which gives us a total of n rescaled d dimensional vectors. which is our desired result. by its corresponding component of bi. and thus takes O of nd distributed computation. that it is storing locally. vector to the driver, which is the driver then must sum. and then sum the vectors in the reduce step. С теоретической частью всё. Осталась еще одна лабораторка, пятая (№5).